With new leaders in 2019, please take 20 (seconds) to sign this legislative petition to designate March 13th as a tribute to America's K-9 Corps. The K-9 Corps was created March 13, 1942. Thus March 13th is the fitting date and Joe's name choice for K-9 Veterans Day. In 2019 TheDogPlace.org reaches 1.2 million dog owners who can move legislators with our vote. 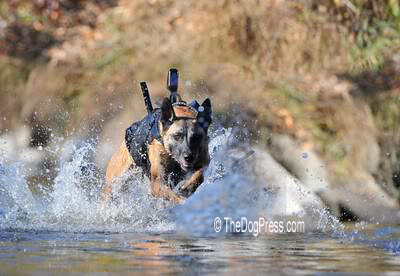 We were successful in achieving passage of the Military Dog Retirement Act in 2015. Let's get this done! 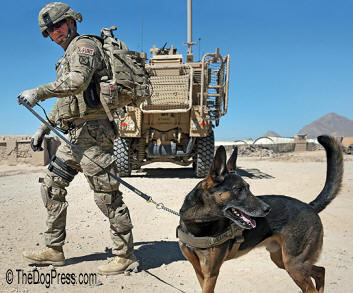 #1 If you are military or own a dog, sign the K-9 Veterans Day Petition. #2 Then call and email your State Representatives (contact info provided below). #3 Ask your friends to include this link on their website or facebook page. Your name and email are required in order to submit the form and validate the petition to Congress. Instant Information on ii NetPlaces Network which NEVER shares or sells user information. Only your first name will be visible and your email is hidden, privacy-protected. 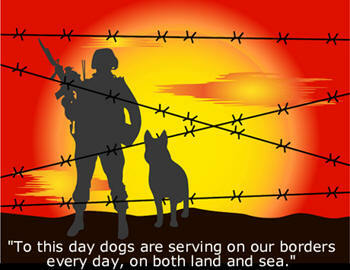 I support March 13th as K-9 Veterans Day to be a National Holiday. Are you a member or officer of a National Parent Breed Club? Are you a member or leader of a State or National Legislative Group? Enter something about yourself (veteran, profession, dog club member, etc.) and a quotable comment we can share with readers. Then tab to or click in next box and enter your name and email (for our internal reference and validation that you are a person, not a machine). Thank you for supporting the creation of National K-9 Veterans Day! Other websites are capitalizing on Joe's vision... seeking donations. We reached out to them, offering to promote them in this section. Not one responded. TheDogPlace.org does not ask for money. We ask only for for your help in making a military dog handler's dream come true. 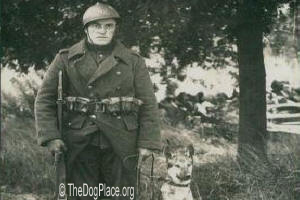 Joe's selfless devotion to the dogs and veterans he served was inspiring. As dog lovers, we cannot allow his vision of official recognition for K-9 Veteran's Day become only a memory. His wife was unable to carry on after his death but TheDogPlace.org is dedicated to Joe's mission. TheDogPress.com celebrates Veterans Day every 11-11. Together we can achieve a National K-9 Veterans Day. From carrier pigeons to military mules, we thank all of the animals serving our Armed Forces! The The NetPlaces Network changed the way our Armed Services ended "service" with passage of the Military Dog Retirement Act. YOU can ask that all K-9 Veterans, military and civil, be honored for helping keep American safe. A gun-shy dog, 2 fearful boys and the Führer's military dog call up. Killing soldiers because it's cheaper than bringing them home?